[ Nancy R. E. Bell, author and wife of artist Arthur George Bell. ] Autograph Letter Signed ('Nancy Bell') to unnamed 'Gentlemen', praising a book on Japan which (as the publishers) they have sent her, and expressing desire to review it. On letterhead of Restgarth, Southbourne, Christchurch. 8 December [ no year ]. 2pp., 12mo. In good condition, lightly aged. The 'Gentlemen' are clearly the publishers of a book which they wish Bell to review. She writes that she is greatly obliged to them for offering her 'a copy of your beautiful book on Japan', and has written 'to 4 editors to ask for space for early notices of it'. The book is 'indeed a marvel of technical skill in reproduction & it would be a pleasure to me to speak as highly of it as it deserves'. [ Thomas Bell, zoologist. ] 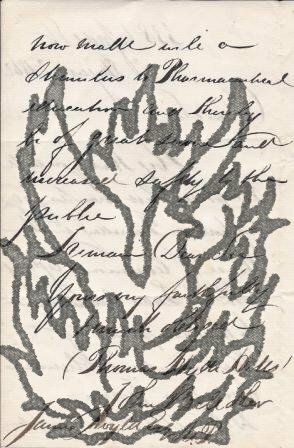 Autograph Letter Signed to an unnamed party, agreeing to second his membership nomination for the Athenaeum Club, and commenting on the 'changeable weather'. On letterhead of The Wakes, Selborne. 18 February 1864. 3pp., 12mo. In fair condition, lightly aged and worn. He writes that he will have 'great pleasure' seconding the recipient's nomination at the Athenaeum Club, and will do so 'the first time I go to London'. He discusses the arrangements before commenting on the 'great disappointment' felt by 'all our party' that the recipient was unable to join them. The letter concludes: 'I hope you have not suffered as so many have done from the very changeable weather &c had - I never knew such variations both in temperature & pressure, for so long a time'. [ George Joseph Bell, Professor of Scots Law at the University of Edinburgh. ] Manuscript Testimonial, Signed twice (both 'George Jos Bell'), on behalf of 'Mr Scipio A. Mactaggart'. On printed card of the 'University of Edinburgh Lectures on the Law of Scotland'. Dated November 1834. The card is 12 x 9 cm. In fair condition, aged and worn. On one side, printed in fancy letters in blue, is 'University of Edinburgh | LECTURES | ON THE | LAW OF SCOTLAND'. Beneath this Bell has written: 'Mr. S. A. Mactaggart | George Jos Bell | Nov 1834'. 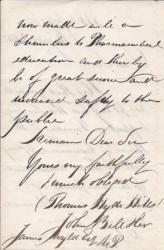 The testimonial, in a secretarial hand, is on the reverse, signed by Bell at the bottom (again 'George Jos Bell'). It reads: 'Mr Scipio A. [Edith Emerson, dau. Emerson; autograph-collecting ] Autograph Letter Signed "Edith Emerson Forbes", to a "Mr. Thorndike". [ Printed heading ] Milton Hall, 28 June 1899. Four pages, 12mo, in large readable hand, bifolium, fold marks, otherwise good condition. "I return the papers you were so kind to lend me and let me keep to show to my travellrs. Printed prospectus for 'The English Pre-Raphaelite Painters, their Associates and Successors, by Percy H. Bate'. 4pp., 8vo. Bifolium. On laid paper. In fair condition, lightly aged and spotted. Printed in black with title in red. The first page headed: 'Now Ready | Small Colombier 8vo. With 7 Photogravure Plates, and 84 Illustrations in Half-Tone, £2, 2s. [Printed pamphlet.] English Line Writing: A New, Simple, and Exact System of Phonetics. Alexander Melville Bell, Fellow of the Educational Institute of Scotland, The Royal Scottish Society of Arts, The American Association for the Advancement of Science, &c., &c.
 + 52pp., 8vo. In grey printed wraps carrying advertisements. In good condition, on lightly-aged paper. With label and stamp of the Science & Art Department of the Educational Library, London. In tasteful modern quarter-bound boards of light and dark grey paper, with white printed label on front. [Offprint.] Upon a Method of Teaching Language to a Very Young Congenitally Deaf Child. By Alexander Graham Bell, Ph.D.
Third edition. Extracted, by permission, from the American Annals of the Deaf and Dumb, April, 1883, vol. xxviii, pp.124-139. Washington, D. C. Gibson Brothers, Printers. 1886. 16pp., 8vo. Including full-page facsimile 'Specimen of Impromptu Conversation' and of 'the plan, recommended by George Dalgarno, of writing the alphabet upon a glove'. In grey card wraps. In good condition, on aged paper, with label and stamp of the Science & Art Department of the Educational Library on the front cover. In tasteful modern grey paper wraps with white printed label on front. No copies of this third edition on COPAC or OCLC WorldCat (but a total of fourteen copies of the first edition). [Offprint.] Fallacies concerning the deaf, and the Influence of these Fallacies in preventing the Amelioration of their Condition. [...] With remarks by Dr. E. M. Gallaudet and Hon. Gardiner G. Hubbard. An Address delivered before the Philosophical Society of Washington, October 27, 1883. Reprinted from the American Annals of the Deaf and Dumb for January, 1884. Washington D.C. Gibson Brothers, Printers. 1884. 39pp., 8vo. Front cover of printed wraps present, with 'With the Author's Compliments' printed in top left-hand corner. In fair condition, lightly-aged, with shelfmarks, label and stamp of the Science & Art Department of the Education Library. In tasteful modern quarter-bound boards of light and dark grey paper, with white printed label on front. [Printed pamphlet, 'With compliments, from | THE AUTHOR'.] World-English: The Universal Language. By Alexander Melville Bell, Author of "Visible Speech," &c., &c.
New York: N. D. C. Hodges, 47, Lafayette Place. London: Trübner & Co. 57 and 59, Ludgate Hill. 1888. + 29 + pp., 8vo. Advertisements at front and rear. With front cover of brown printed wraps present, bearing the title in a 'globe' design. Printed in a box in the top right-hand corner of the cover is: 'With compliments from | THE AUTHOR, | 1525, Thirty-fifth Street, | Washington, D. C. | Examination and comment requested.' In good condition, on lightly-aged paper, with slight loss at edges of front cover. In tasteful modern quarter-bound boards of light and dark grey paper, with white printed label on front. Uncommon: four copies on COPAC. [Printed pamphlet.] On Reading as a Means of Teaching Language to the Deaf by Alexander Graham Bell. An Address delivered before the sixth National Conference of Superintendents and Principals of Institutions for the Deaf held at the Mississippi Institution, Jackson, Miss., April 14-17, 1888. Washington: Gibson Bros., Printers and Bookbinders. 1889. 7pp., 8vo. With front cover of grey printed wraps. In good condition, on aged paper, with label and stamp of the Science & Art Department of the Educational Library, London on front cover. In tasteful modern grey paper wraps with white printed label on front. Epigram beneath title: 'I would have a deaf child read books in order to learn the language, instead of learning the language in order to read books.' Uncommon: no copy on COPAC and nine copies (all in American libraries, including three at Harvard) on OCLC WorldCat. [Printed pamphlet.] The London Schools' Guild of Arts & Crafts. Its Origin and Purpose. A Leaflet of information issued with the object of extending the influence of the Guild outside London, 1928. 'Please address all communications to Mr. William J. Pettit, (Hon. Sec.) The London Schools' Guild of Arts & Crafts, Stoke Newington Central School, Albion Road, London, N.16. 12pp., 12mo. In cream wraps printed in brown. In good condition, on lightly-aged paper, with rusted staples and shelfmarks, stamp and label of the Board of Education Reference Library. Foreword (pp.1-2) by Bell, and text (pp.3-12) by Pettit. Scarce: no copy on COPAC. [William Scott Cameron, editor of the Leeds Mercury.] Autograph Letter Signed ('W S Cameron') to George Bell, giving his reasons for decling his 'verses'. On letterhead to the 'Weekly Supplement to The Leeds Mercury, Leeds'. 10 April 1891. 1p., 12mo. On aged and worn paper. Cameron writes: 'Dear Sir, | I regret that the enclosed verses would occupy too much room for our space, but I return them with our thanks to you for bringing them under our notice'. The recipient is not the London publisher, who died in 1890. [Sheila Kaye-Smith, novelist.] Autograph Letter Signed to 'Mr. 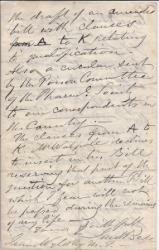 Cazenove' of the publishers George Bell & Sons, regarding the publication of her first novel 'The Tramping Methodist', requesting corrections to the proofs and suggesting the title. On letterhead of 9 Dane Road, St Leonards on Sea. 20 May . 3pp., 12mo. On bifolium. In good condition, on lightly-aged paper. Docketed at head of first page. She begins by explaining that at her 'interview with Mr. Bell on the 8th. he suggested an alteration in an important sentence, giving me the alternative of taking the MS. home with me or of correcting the sentence in the proofs. At the time I thought the latter course would be the best, but it occurs to me that it would save expence if the correction was made now.' She asks Cazenove to 'ask Mr. O'Connor if he would kindly alter the words in accordance with the enclosed [not present]'. On letterhead of 11 Buckingham Gate, S.W. [London]. 23 May 1911. 2pp., 12mo. In good condition, on aged and worn paper. 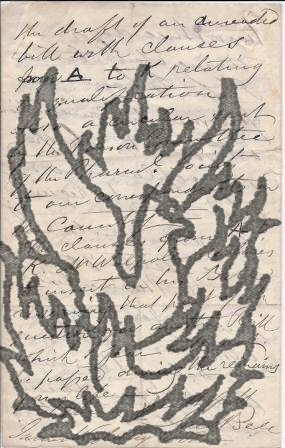 The letter reads: 'Dear Prof. Candy, | I think you would wish to see enclosed which please return after perusal. | If you hear of anything kindly let me know. It is the most pressing difficulty we have and we see no present way of surmounting it. | With renewed thanks, | always sincerely yours, | Mackenzie Bell'. [Printed book.] Summary of Doctrines taught in Christian Meeting House, 90 Norfolk Street, Laurieston, Glasgow. By the late James A. Begg. With a Memorial Discourse, by William Fulton. Glasgow: Printed by Bell & Bain, 41 Mitchell Street. 1869.
xl + 112pp., 12mo. In original buff printed wraps. In good condition, on lightly-aged paper, in worn wraps, with front wrap becoming detached and chipping to the spine. Fulton's memoir, on pp.v-xl, has the drophead title: 'In Memory of the late James A. Begg, Bookseller, Argyle Street, Glasgow. A Discourse by William Fulton. Sunday, 3d January, 1869. Scarce: no copy in the British Library, and the only copy on COPAC at the Bodleian. Of Bain's careet Fulton writes on p.xxxlii: 'James A. Begg was born in Paisley, at the beginning of this century. Beekeeping Diary of Amy Mary Driberg of Uckfield Lodge, Crowborough, mother of Labour politician Tom Driberg, containing dated and initialled autograph entries, and detailed accounts of honey taken, sold and given away, with a few ephemeral items. [Uckfield Lodge, Crowborough, Sussex.] Dated between 1 July 1932 and 4 July 1938. 142pp., 4to. In a ruled notebook, bound in black cloth, with marbled endpapers. In fair condition, on aged paper, in worn binding with loss to a corner of a board. Starting at one end of the notebook is the diary of autograph entries, each dated and initialled by Mrs Driberg. In 1932 Mrs Driberg, a formidable Scottish widow in the last years of her life, has five hives (numbered 1 to 4, with a fifth observation hive), with a sixth hive (No. 5) added by 1934. [Printed pamphlet.] Empire "Socialism" By R. Palme Dutt. Published by the Communist Party of Great Britain, 16 King Street, Covent Garden, WC2. ['Printed by Centropress Limited (T.U. Throughout) 168, Camberwell Road, London S.E.5.'] February 1925. 20pp, 12mo. Stapled. In red printed wraps, with cartoon on cover showing giant worker sweeping away miniature capitalists. In fair condition: lightly-aged and with central vertical fold. Scarce: the only copies on COPAC at the British Library and Warwick University. [Printed handbill.] A few Tingling Rhymes On Much Wenlock Chimes. 1p., 12mo. Good, on lightly-aged pink wove paper. Within fancy border. Beneath the title a four-line epigram by 'Cook', beginning 'The School-boy remembers his holiday ramble'. The poem proper, of twenty lines, is signed in type at the end 'J. H.' It begins: 'Oh! Wenlock Chimes, the dear old Chimes, | You carry us back to by-gone times,' and ends, 'And 'ere your notes their rest have found, | Cheer all our Friends the Wrekin round.' The word 'your' in the penultimate line is printed 'you', with the final 'r' added in manuscript. Autograph Letter Signed from '<James?> Bell' of Hastings, written while dying, to James Wyld, member of Parliament for Bodmin, regarding a Parliamentary Bill on the sale of poisons. 12mo, 4 pp. 64 lines. Text clear and complete. Good, on lightly-aged paper. He was 'mistaken about the Marylebone Election - Having been a prisoner so much lately' he had 'not seen many electors & those whom I saw thought it was too late & regretted to see a split in the liberal party'. He 'did not influence a single vote being too unwell to take any part in it'. He 'left town to escape the excitement'. He has 'already troubled our new Representative with a little Parliamentary Business', and is sending Wyld 'some documents on the same subject by the Book post'.